I would like to thank all my Gujarati friends for treating me with all the Gujarati delicacies and also for sharing the recipes. Even for this Ganesh Chaturthi along with kozhukattai, I relished the yummy churma laddoo. :-) I explored quite a few Gujarati recipes during the monthly thali theme, and I had the trevti dal on my list for the thali theme. But I went with the sweet and sour dal during that time and saved the trevti dal for this month. 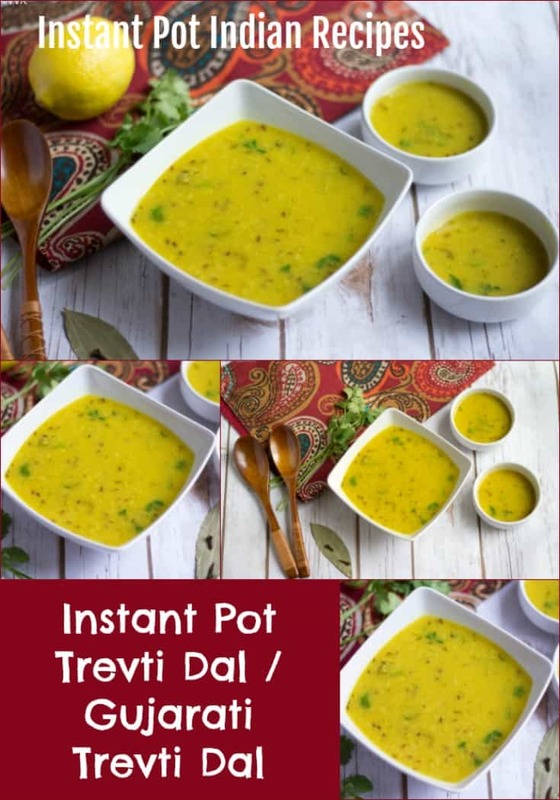 This trevti dal is a mild yet delicious dal with delicate flavors of green chili, cilantro, and ginger. Vaandu loves this dal, and that says it all. :-) He loves this with rice and also relishes this as a soup. With three lentils combined, you get a fair share of protein dosage too. Be it with roti or rice or thepla; this dal will surely brighten up the entire meal. Check out the video recipe here and please do subscribe to my youtube channel and stay tuned for more recipes. Wash and soak the dal for 15 minutes. Grind the green chili, ginger, and cilantro together without adding any water. Set the instant pot in saute mode and add the oil. Once the oil is hot, add cumin seeds, bay leaf, cloves, cardamom, and hing. Saute for a minute and as they start to splutter, add the washed and soaked dal. To this dal mix, add turmeric, sugar, and salt and combine them all. Then add the ground cilantro-ginger-green chili paste. Add two cups of water and mix all the ingredients nicely. Set the IP to manual mode and cook it for 10 minutes and let the pressure release naturally. Once the pressure is released, open the lid carefully and mix the dal. Set the IP back to the keep warm mode. If required, add 1/2 more cup of water. Finally, add the cilantro and lemon juice and turn off the IP or you can set it in keep warm mode until you serve. Wash the three dals and pressure cook it by adding 2 cups of water and turmeric powder for up to 3 whistles. Once the pressure is off, mash the dal and set aside. Saute for a minute and as they start to splutter, add the cooked dal. Then add turmeric, sugar, ground cilantro-ginger-green chili paste and salt and mix. If required add 1/2 more cup of water and let it simmer for 5 minutes. Finally, add the chopped cilantro and lemon juice and turn off the heat. You can change the dal measure as per your preference. Three equal measure is preferable, but you can choose according to your preference. 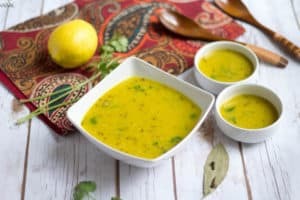 This recipe is a no onion no garlic dal recipe. But you can add both onion and garlic during tempering. You can use ghee while tempering but as I wanted to keep it vegan, I went with regular oil. I prefer grinding cilantro, green chili, and ginger, but instead, you can mince them finely or ground them roughly in a mortar pestle too. nice comforting yellow color dal. loved the clicks. 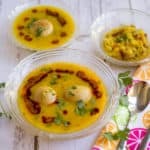 I already tried this dal.. combination of three yellow dal. Love your clicks , looks fab. Thanks a lot Preeti. Glad you liked it. 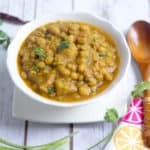 I am so enjoying reading all the dals from all states, great job!..this dal looks so inviting all so bright yellow!..I know I will bookmark all of this for later cooking..
IP is quite a new concept here and your video is helping in understanding it. 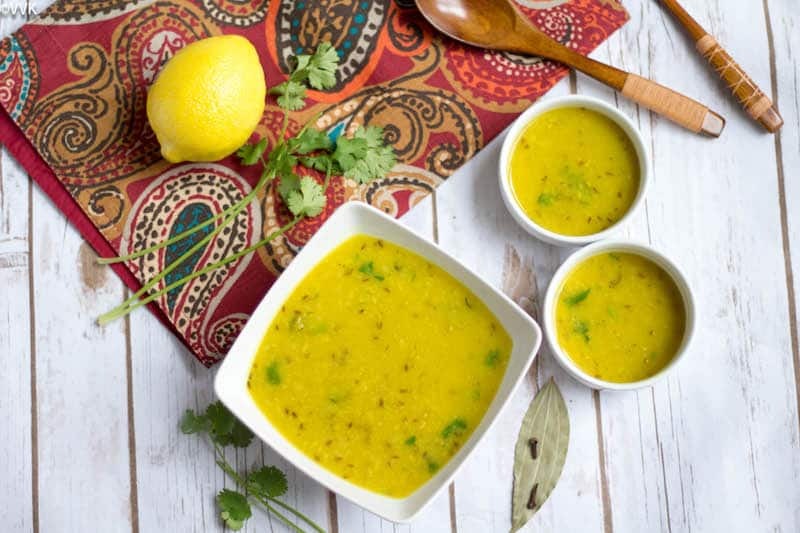 Such a simple yet delicious dal recipe. looks so yum..
Glad you liked it Gayathri. This is comfort meal , and mixing three proteins is an excellent idea . Fantastic clicks the daal is tempting , just need a bowl of rice . 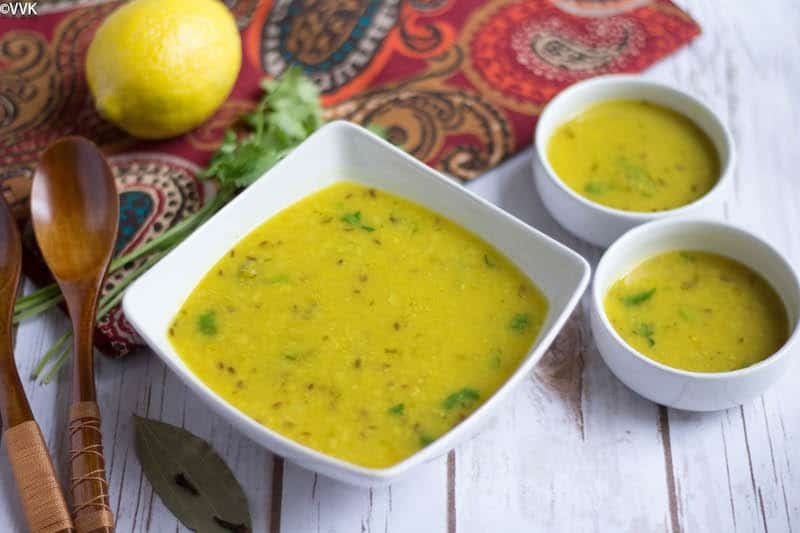 Simple yet comforting dhal and love the way you made in IP.Even my kids love this kind of dhal along with rice and ghee..
A regular dal at home for us. Make it ever so often but I add garlic to it. Next time I’ll grind the coriander into a paste. Love the color of your dal. Oh yeah very true about friends. Thanks Rajani. Treveti dal sounds so interesting.. and with three dal I should really give a try once.. With your states wise dal..i simply await your posts daily!! 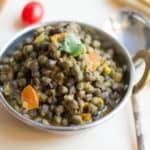 Such a comforting dal, serve me this fingerlicking trevti dal with some rice and pickles, i can have it everyday without any fuss. Such an eyepleasing bowl there. Reading your posts of using IP, I guess I should also invest in Instant pot. The trio of dal looks very inviting and all I would need is a bowl of jeera rice to finish it. It’s a good investment Sapana. Saves a lot of time. Amazingly delicious dal love the addition of bay leaf and cloves. Such a nice bowl of dal. 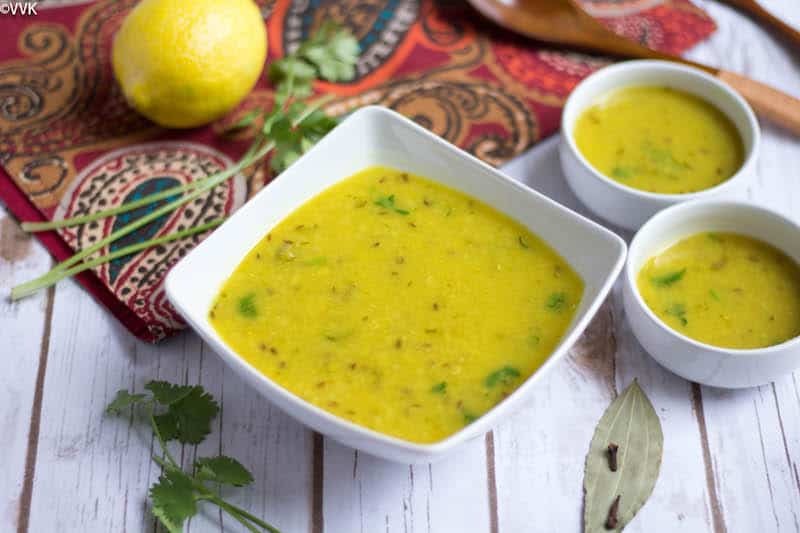 I love trying out different dal varieties and bookmarking this one too. I am a fan of Gujrati food too, especially their snacks and munchies. 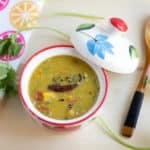 This dal looks fabulous, something we can put together with ingredients easily available at home. Lovely pics too! Same pinch. Love all their goodies. :-) Between thanks, Sowmya.